LAS VEGAS — Dale Earnhardt Jr., who retired from full-time competition in the Monster Energy NASCAR Cup Series at the conclusion of the 2017 season, has been named the National Motorsports Press Association Most Popular Driver for the 15th consecutive time. Earnhardt’s selection was announced Thursday during the Monster Energy NASCAR Cup Series Awards program at the Wynn Las Vegas. Earnhardt, 43, was named on nearly 68 percent of the votes cast by fans. The driver of the No. 88 Chevrolet for Hendrick Motorsports, Earnhardt is one of eight drivers to receive the award on multiple occasions. Only one other driver, Bill Elliott, has won the award more often — Elliott was named the series’ most popular driver 16 times between 1984 and 2002. Completing the top 10 in this year’s voting were (listed alphabetically): Ryan Blaney (Wood Brothers Racing No. 21 Ford), Kyle Busch (Joe Gibbs Racing No. 18 Toyota), Chase Elliott (Hendrick Motorsports No. 24 Chevrolet); Jimmie Johnson (Hendrick Motorsports No. 48 Chevrolet), Kasey Kahne (Hendrick Motorsports No. 5 Chevrolet), Matt Kenseth (Joe Gibbs Racing No. 20 Toyota), Kyle Larson (Chip Ganassi Racing No. 42 Chevrolet), Danica Patrick (Stewart-Haas Racing No. 10 Ford) and Martin Truex Jr. (Furniture Row Racing No. 78 Toyota). The Most Popular Driver Award is the only major NASCAR award determined solely by fan vote. It has been presented annually since 1953; the recipients were originally determined by a poll of competitors. It became a fan-driven program in 1984 under the guidance of the NMPA. Thirty-three drivers received votes for this year’s award. In addition to hosting the voting platform for the Monster Energy NASCAR Cup Series MPD award, fan votes to determine the Most Popular Driver in the NASCAR XFINITY and Camping World Truck Series were also hosted on NASCAR.com. Elliott Sadler, who finished second in the XFINITY Series championship battle won the NASCAR XFINITY Series MPD award; Sunoco Rookie of the Year Chase Briscoe was voted Camping World Truck Series MPD by fans. Sadler and Briscoe will be honored Dec. 9 during NASCAR Champions Week in Charlotte. The NMPA Most Popular Driver Award is one of the longest-running awards presented annually by the National Motorsports Press Association. Since 1984, it has been the only major NASCAR award to be determined solely by fan vote. 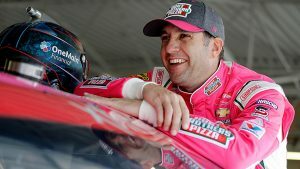 Elliott Sadler was announced Tuesday as the NMPA Most Popular Driver in the NASCAR XFINITY Series for the second straight year. Sadler, who was also the top vote-getter in 2011 and 2016, becomes only the third XFINITY Series driver to win the award three times. Brad Keselowski (2008-10) and Kenny Wallace (1991, 1994, 2006) are the other three-time recipients. The award for Sadler, 42, is the latest in a six-year run by drivers for JR Motorsports. Other JRM winners of the XFINITY Series’ Most Popular Driver Award: Chase Elliott (2014-15), Regan Smith (2013), Danica Patrick (2012) and Keselowski (2008-09). Sadler finished second in the XFINITY Series standings for the second consecutive year. The Virginia native took eighth place in the season finale at Homestead-Miami Speedway, five spots behind JRM teammate and series champ William Byron. 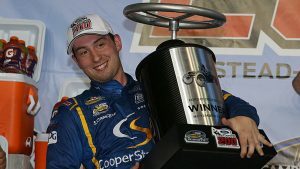 Rookie Chase Briscoe was named Monday as the 2017 National Motorsports Press Association’s Most Popular Driver in the NASCAR Camping World Truck Series. The recognition comes 10 days after Briscoe, 22, scored his first career victory in the season finale at Homestead-Miami Speedway. The Indiana native finished sixth in the series standings and claimed four pole positions on the way to Sunoco Rookie of the Year honors. What do dirt fans, a 1-eyed  and a grandma have in common? @ChaseBriscoe5 makes one final plea for your votes for #NASCARMPD in this spot for the @EldoraSpeedway Windshield Duster.